In most “dungeon crawl” type games, in which the players move around and discover a map filled with enemies while seeking objectives, the balancing of progression – of the simplified “levelling up” mechanic derived from role-playing games – is in an awkward position. A fully-fledged roleplaying game has a much longer progression track and a much wider design space for gaining abilities; there is a much larger portfolio of things to improve (base statistics, the character's library of abilities, the efficiency of existing abilities, non-combat skills and feats etc) while a board game generally reduces the entire design to a series of, or indeed single, combat encounter. This smaller design space means that each level has a smaller number of possibilities – and thus the rate of progression is a lot faster. Similarly, a board game is designed to be played to completion in a single session – the levelling mechanics in a role-playing game are for a campaign lasting several sessions. Thus a player may well gain several levels in one game. In some cases, the players gain ability too quickly for the limited pool of enemies (restricted often by game components) to keep pace; a game like Doom or even to some extent Descent has the players rapidly become untouchable by minion enemies. This is unsatisfying design for the players; there is no sense of risk (or in the case of Doom essentially no way for the “game-master” to defeat the characters). 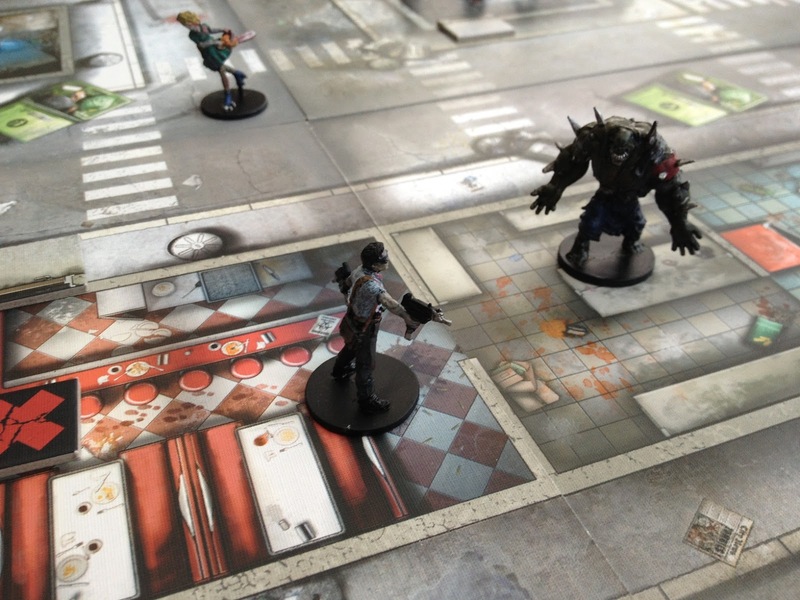 Here is where the subject of this review – the game Zombicide – stands out. It makes the players ration their upgrades, and makes levelling up a bad decision. This is done through a very limited enemy pool, and the enemies never becoming less dangerous. Instead, what increases is their numbers – the real skill in the game becomes action management and the incremental benefits from levelling up do not adequately address the limited action economy. This is mostly due to the fact that the enemy scaling is linked to the highest-level player – they will also thus be the most powerful, and so the most likely to continue gaining levels and further increasing the gap. This adds a much stronger aspect of risk management; success at combat actions is never guaranteed, actions are highly limited, and the strongest characters must often avoid combat to allow the weaker to catch up. As a result, Zombicide feels the one of the most strongly teamwork-focused – and thus the most thematic – games in its genre. The players are weak and cannot get stronger in terms of health, only more efficient at carrying out basic actions. Item cards increase the odds of successful combat but also influence the enemy piece movement – and most crucially to the action economy, each new area explored adds the equivalent of one or two turns' spawned enemies to the map immediately while also costing an action (and requiring a specific item). 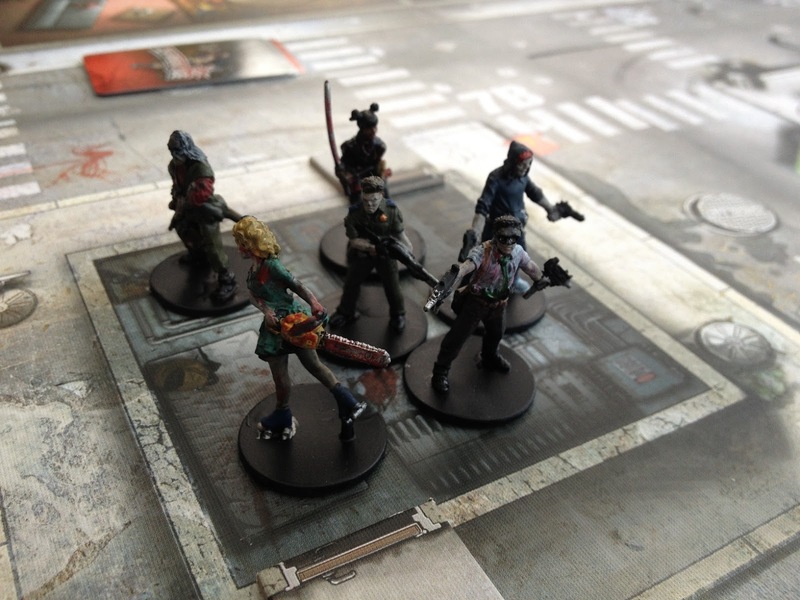 The structure of a round of Zombicide shows well its strength; on the player's turn, they take three or four actions in a strict order. They activate each of their characters, and then pass the turn to the next player. 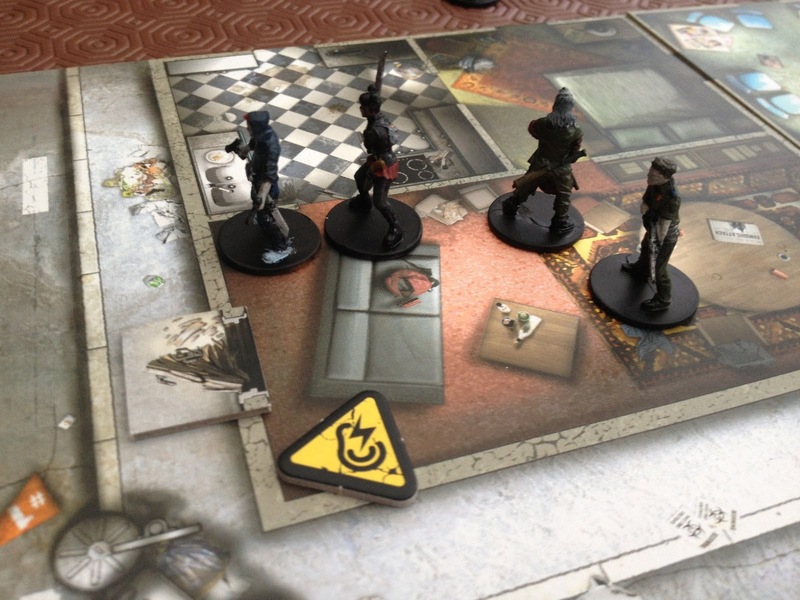 The player order is fixed clockwise around the table, with the start player changing each round – thus allocating items efficiently (giving items that open doors to the first player so they can spawn the bonus enemies before other players act, for example) is paramount. The choice of actions is simple; move, gain items, attack enemies (often creating noise, which serves as a waypoint for the enemy movement), or collect objectives. Objectives, to complicate things, can also give experience points (and thus hasten the progression of characters, meaning they need to be used to boost weaker players even if a stronger player has reached it first). 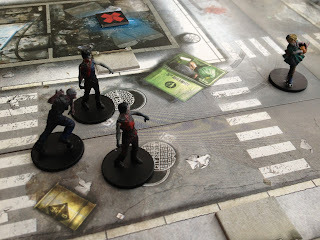 While there is a sense of urgency from the continued enemy spawns, the enemy movement is very predictable and can even be manipulated using actions – the strategy of the game involves understanding what will happen in the enemy turn, and weighing this against the unpredictability of exploring new areas. This, too, is thematic; the enemies are zombies, adhering to genre traditions (slow, fixed-purpose movement drawn to living people first and disturbances second). Combat is a simple dice vs target number mechanic, with the target number modified by weapon; in an elegant mechanic, larger enemies require stronger weapons not more successes to defeat. A level 2 enemy must be killed by 1 success from a level 2 weapon, not 2 successes from a level 1 weapon. Thus there is clear delineation between weapons which can generate multiple successes (and clear out weak enemies) and those which can bring down heavier enemies. Ranged combat is also a high-risk prospect; there is a strict table of target priority that hits friendlies over enemies and thus forces melee combat and careful consideration of turn order. Once each player has activated their characters, the enemy phase proceeds; first enemies attack (if able; there are no ranged enemies) and then move. Fast enemies then return to the top of this list of possibilities, either attacking if able or moving again. Enemy movement is, as explained above, strictly defined by proximity to players or noise markers; however, if a group of enemies would divide at a fork in the road then enemies are added to ensure an even distribution. Once all enemies have moved, then for each entry point on the map more are added based on a random card. Each card has four options, tied to the highest-level player – thus as the players progress more enemies appear. The mechanics are simple and predictable, and while chance-based the skill element is in manipulating them. What this serves to do is make Zombicide a much more interaction-based co-operative game – it relies far more on direct communication and co-operation since the progression of any individual character too far is a liability.